Greetings and welcome to another post on this AmigaOS 4 gaming blog. Today we’re going to have a look at a small game called Tuxpuck. It was created by Jacob Kroon and ported to AmigaOS 4 by ToAks. Do you remember Shufflepuck Cafe on your Amiga 500? If yes, then you will probably be familiar with Tuxpuck, since it is the same type of game. When it has been downloaded, extract the archive to a directory of your choice (right-click on the icon, then choose “extract to”). Now you can click on the game to start playing. 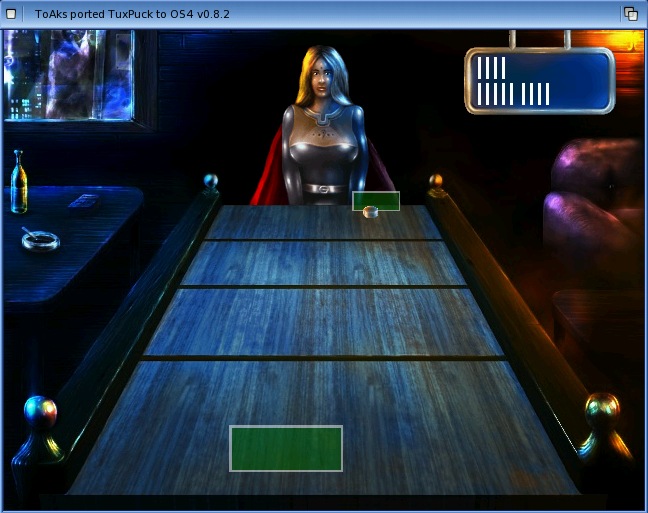 Tuxpuck is a computer air hockey game. The goal is to score more points than your opponent and thus become the winner of the game. It’s not much more to it than that. Now let’s see how this virtual air hockey game performs. As you can see from the screenshots above, you don’t have many options and there are not more than two characters in the game. You can choose to play against Tux or Arcana. Tux should be familiar to Linux users, while Arcana is Arcana I guess. I chose to play Arcana first, but that was a bad choice. The reason? She’s the most difficult opponent of them. You’ll see how bad I performed below. It was easier to play Tux, but he was still quite a challenge. So how does the game perform? Thanks for reading and for visiting this blog. Hope to see you again in a future post.